An explanation for the UFO known as the "Black Triangle" may have been found. From 1982 to 1985 researchers from the Defense Advanced Research Projects Agency (DARPA) and NASA revived the notion of the Trans-Atmospheric Vehicle (TAV). This project became known as Copper Canyon. The objective was to find a replacement for the Lockheed SR-71 Blackbird which was retired from service in 1989. This was also around the time of the first "triangle" sightings. From the numerous eye-witness reports of the triangle it became obvious that the vehicle is hypersonic rather than supersonic, as was the SR-71. The SR-71 was very capable of a Mach 3.5+ performance, and given the many advances in American military technology since the SR-71 was designed, it isn't unreasonable to assume that an aircraft capable of a Mach 5+ performance has been developed. However, the SR-71 was returned to service in 1996. It's replacement may have been the Advanced Stealth Technology Reconnaissance Aircraft (ASTRA), which has often been referred to, mistakenly, as Aurora. On March 4th, 1997, the BBC in the United Kingdom ran a news item showing film footage which had been secret for nearly 20 years. The film showed a Hercules aircraft fitted with rocket boosters to the front, rear and undercarriage. The plane was able to take off almost vertically and be airborne in under five seconds. The project's aim was to enable the aircraft to land on ground the size of a soccer pitch, pick up hostages in Iran and take off in less than a hundred yards. The project was started in the late June of 1980, abandoned in October of that year and cost $30 million. The reason for halting the project was, apparently, that on the first test flight the plane crashed on landing. The BBC didn't actually tell the whole truth in their report of the incident. There was in fact three aircraft involved and it is strongly rumored that the project was a success. Incidentally, the hostages were released three months later. The C-130 Hercules is the heaviest carrier in service in the Royal Air Force (RAF). If the project was successful and the technology applied to smaller fighter planes, the speed in which they could be airborne could rival the Harrier jump-jet. Assuming the ASTRA has been in active service since 1989, what has DARPA and/or NASA been developing and test-flying since then? This brings in the concept of Aurora. It has been suggested that Aurora's configuration resembles that of a pure delta ranging from 100-200 feet. If the Aurora has an advanced version of the Hercules rocket system giving it jump-jet capabilities and stealth technology it would be a formidable aircraft, a giant "triangle" that would be able to hover and depart at great speed. It is also suggested that the aircraft has an advanced form of vectored thrust and that the powerplant is a Pulse Detonation Wave Engine. From the numerous worldwide reports it seems that the "Black Triangle" is a very real and advanced craft. To develop such a craft an advanced level of technology and a lot of money is required. The only country which could meet these standards is America, with Britain possibly as well. A group of six soldiers on maneuvers on Salisbury Plain encountered the "triangle" at approximately 2a.m. one morning. This event occured in the winter of 1989, again around the time of the first "triangle" sightings. According to one of the witnesses they came across a copse in a wood where they saw bright lights. Looking up the men saw a large black craft which suddenly beamed a powerful light into the copse. The size of the craft was estimated to be as big as a C-130 Hercules or bigger. The enormous craft hung motionless without sound then suddenly departed at an incredible speed, still silent. Later during hypnotic regression, one of the soldiers recounted an amazing story. He told how a beam of light had encircled the man paralysing him. At this time a man wearing a black zip-up flying suit appeared from the woods and spoke to them in an American accent. In the moments that follow we are told how the beam moves the man, making them shuffle along the edge of the woods. 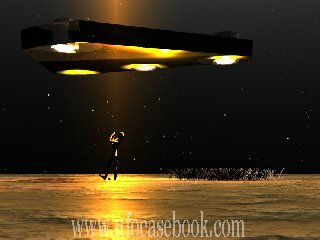 The witness then looks up and sees a black triangular craft, sort of wedge-shaped, with the beam of light coming from it's center. He then goes on to describe how the light pulsates with a humming noise. The soldier then recalls how they found themselves 600 meters from where they should have been. Other details were disclosed in this account that lend weight to the conclusion of American involvement, such as the insignia worn by the American on the left chest area. In light of this information - the Pulse Detonation Wave Engine, the advanced form of the Hercules rocket system and the witnesses' testimony - we can make the connection between the Triangle and America.